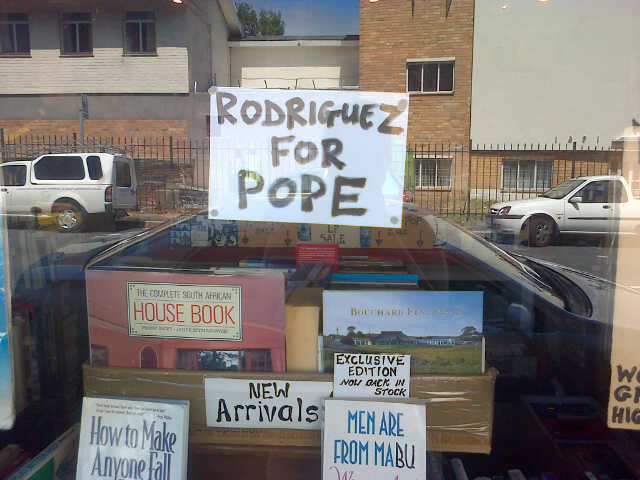 …but Rodriguez would never perpetuate a hoax! Tee-hee! Why not, he’d be better than any of the 265 we have had so far! Mind you I am a non-religious humanist, which I’m guessing Rodriguez may be, going by his lyrics. Love that man! We don’t need any popes or prophets. I wouldn’t want to asscoiate him with any of that rabble. Rodriguez just being who he is is enough, as it is for any of us who are all teachers for those that are willing to listen. It is my dream to meet him one day. I hope I do. Saw him in Bristol, (UK) last December, but didn’t think to try to see him backstage – big mistake, it might have been possible. Doh!